When I woke Saturday morning the first thing I did was to look out of the window, a sigh of relief to see it was overcast and I felt hopeful the weather wouldn’t change! As always the great British weather is never what you think and before it was 3 pm the sun was beaming down in a very busy Newcastle city centre! After a few delays, we were finally off at about 3.20pm, 20 minutes later than planned. I had a strategy all planned in my head, realising if I do a steady mile at first then speed up after each mile I should easily beat my time from last year! First mile down and strategy out the window; I recorded a mile almost one minute faster than planned but the pace felt good. I thought to myself I don’t feel like I’m pushing too hard so let’s keep the pace. Two miles down and the weather was just getting hotter; no water for at least another 2 and a 1/4 mile. My mouth was so dry and it’s all I could think of. A lot of runners had found some shade on Scotswood Road and I followed them for as long as the shade lasted. It definitely helped! Pace still felt really good and at last the water station was in site. The marshals couldn’t get the water out quick enough, but I managed to get a cup, sip a little then use the rest to cool me down and off again I went. Pace still feeling good but by this time the sound of sirens are going off; one ambulance passed and then another two. As I approach the end I can see that two runners were receiving medical attention. I grabbed my friend who was running as I started to panic. I thought what if I overheat, I’ve no water and I’m so close to the end. I was also worrying, hoping that these runners were okay; it was unbelievably warm with no breeze! Once I passed, I then started having the dreaded conversation in my head. I could feel a twinge in my knee, but couldn’t decide if I was just imagining it. I could see Morrison’s, so I knew the end was in site, this often happens with me as soon as I’m close to finishing, it’s like a little trigger starts and I just want to stop. I pushed on hard. I knew the end was near, all I could think of was a drink of water so I powered on and wound the speed up! I was focussed to get to this finish line as quickly as I could and that’s what I did! I crossed the line feeling amazing, but my body didn’t know what to do. The heat and everything got to me but I did it and also got a course PB! 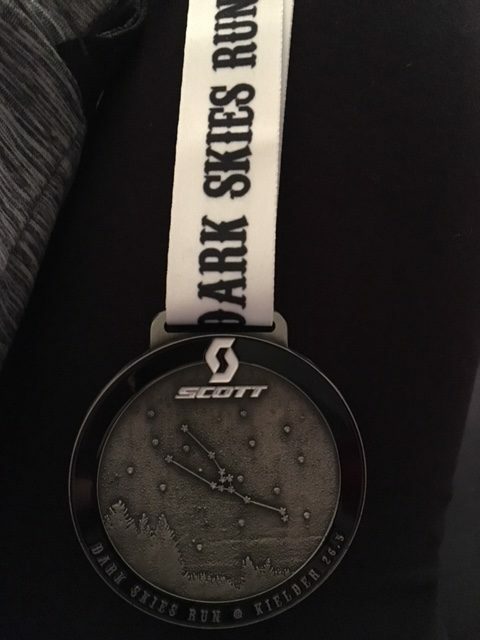 I finished in 51:13, I couldn’t be happier! 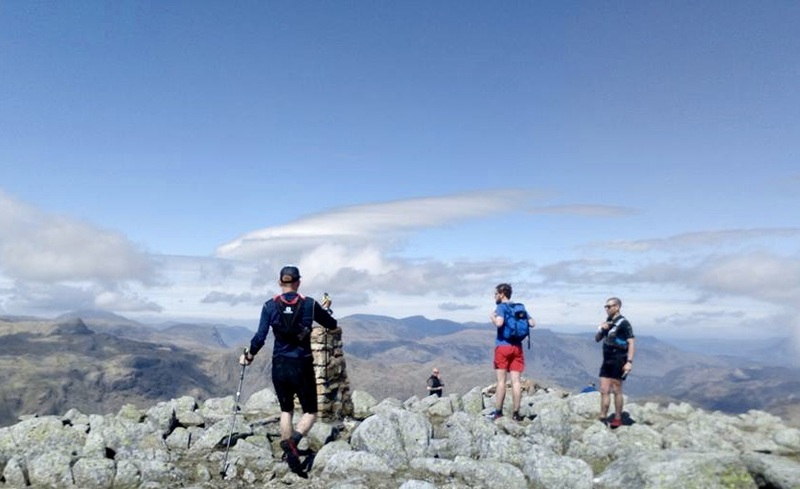 The Bob Graham Round is a fell running challenge that involves completing a route of approximately 66 miles and 27,000ft of ascent over 42 of the highest peaks in The Lake District. The round was first done in 1932 by Bob Graham, a hotel owner in Keswick, who at the age of 42 wanted to complete a circuit of 42 lake-land fells, within 24 hours. The round is known as the testing ground for the supremely fit and being a lover of extreme challenges, from the second I heard about it I knew I had to complete it. After a little research into what exactly the round involved, I knew I had to become a member of a running club if I wanted to have any chance of completing the round. 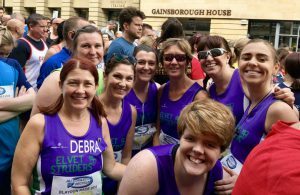 This is when I decided to join Elvet Striders. I always remember my first night at the club. 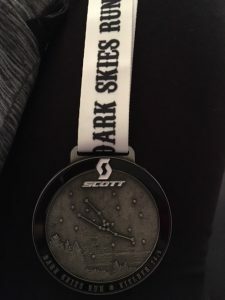 I was really nervous about coming down, I’d always previously run by myself, I’d never had any sort of structure or planning to my training and I was worried everything would be too serious for me, up until this point all my running had been the way you are not meant to do it, but somehow I’d always managed to get that to work for me. The first night I listened to all the run options and was immediately drawn to this guy known to as ‘The Mudman’. I could not have been made to feel more welcome at the Club and after a short conversation, he asked me why I had joined up. I asked him if he’d ever heard of a challenge in The Lake District called the Bob Graham Round, he said he had! I’ll always remember Geoff asking me what I’d done previously and how much fell running I’d done. 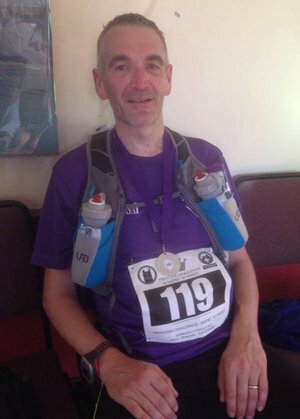 When I said none, I just wanted to do The Bob Graham Round (BGR), I’m sure he thought I was insane! I felt a bit daft at this point. 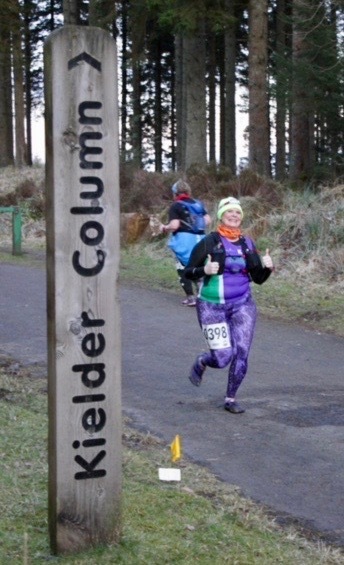 Saying you want to do one of the biggest fell running challenges there is, then admitting you’ve never actually taken part in a fell race, is not the usual approach. Not at any point during this initial conversation did Geoff ever mention he had done the BGR. He was obviously a very experienced runner and I was instantly worried I’d just introduced myself as a total ‘gob-shite’, so I had no option now but to complete the round to prove I wasn’t. 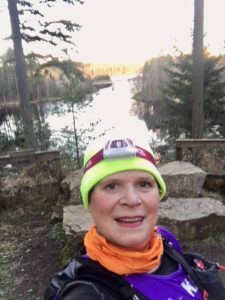 I soon became a regular at Striders, every Wednesday night, and was really enjoying challenging myself, building up the miles and becoming a better runner. 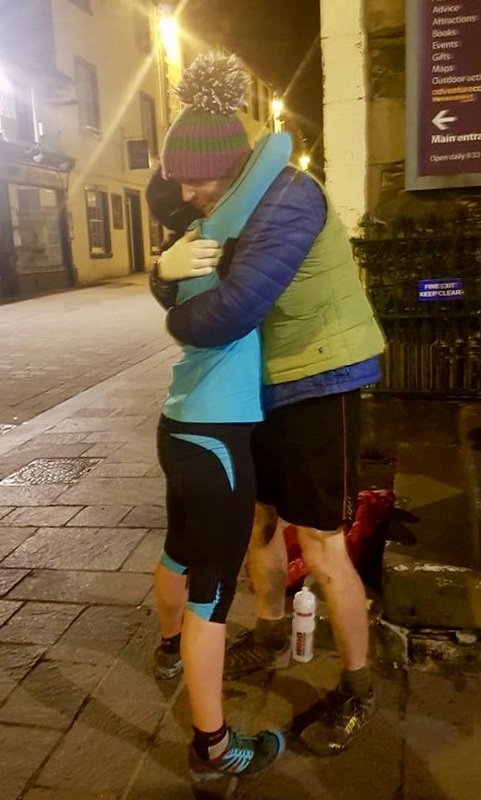 In January 2017, I was involved with road support on Andy Berry’s winter Bob Graham Round and although my part was only small, I drove all the way back to Durham buzzing about what I had just witnessed and dreamed about the day I might be able to complete the challenge myself. The night of Andy’s round I’d also got talking to one of his support runners a guy named Paul Johnston. He asked me if I’d ever fancy it one day and when I said yes, he said please remember me and get in touch when you have a date. I did save his details and Paul did indeed end up supporting me. 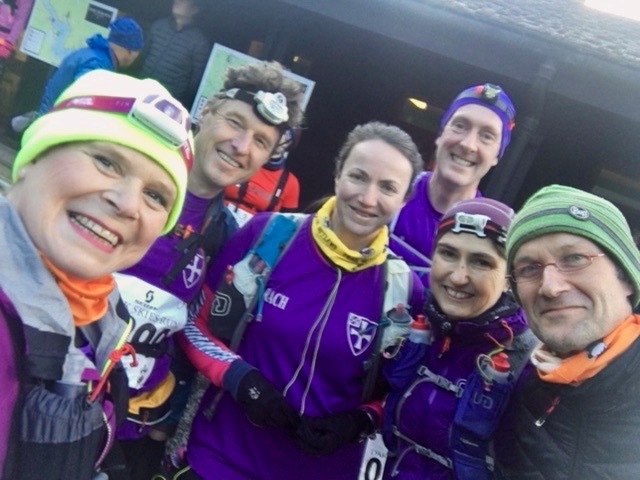 Throughout my whole BGR experience, I have come across so many random fell runners that have been more than happy to put themselves out to help me train and achieve my goals. It really is humbling and also leads to the BGR being so much more than your average long-distance challenge. 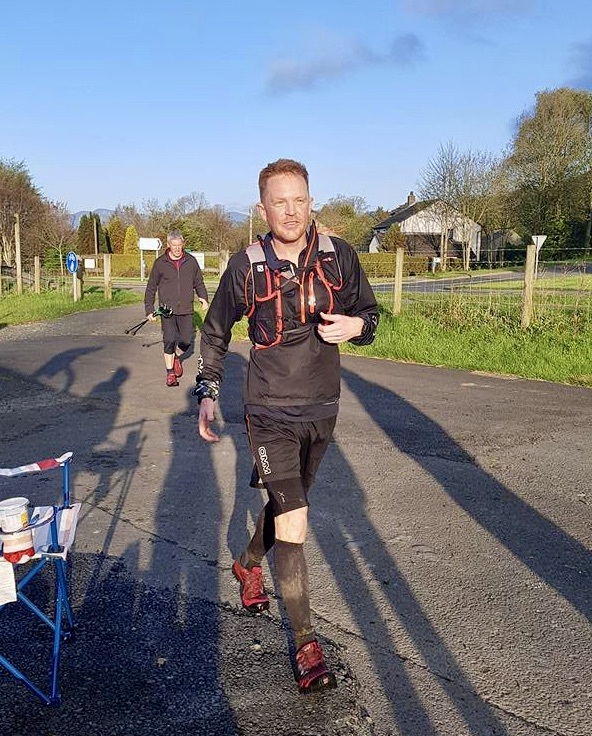 Not long after witnessing Andy’s round I got back in touch with Geoff and was given the details of a few others at the Club who might also be interested in training for a BGR. I’d made a couple of solo trips to the Lakes but I’d found these extremely hard. The terrain is brutal, the weather is harsh and if your navigation isn’t the best, it can make things very dangerous. 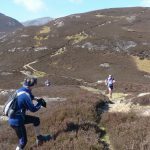 Unfortunately, people have died whilst recceing the BGR. You really do need to have the utmost respect for those hills. The other problem I had with my early solo recces is I needed someone to reassure me that what I was doing was correct. I found the course so hard at times. I was convinced that what I was doing wasn’t right; my map must be wrong, surely it couldn’t be this hard, surely nobody could ever complete five legs of this course when I was struggling with one. These questions and doubts were all going through my head and this is why I needed to be with someone else. 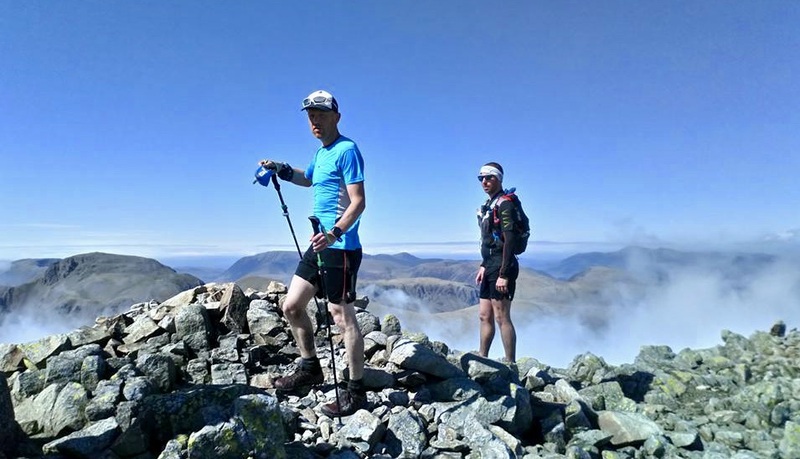 One of the first people I met through the BGR was Scott Watson; he was training for his own BGR attempt and played a massive part in my early Lakeland adventures. The first run I had out with Scott really was a shock to the system. 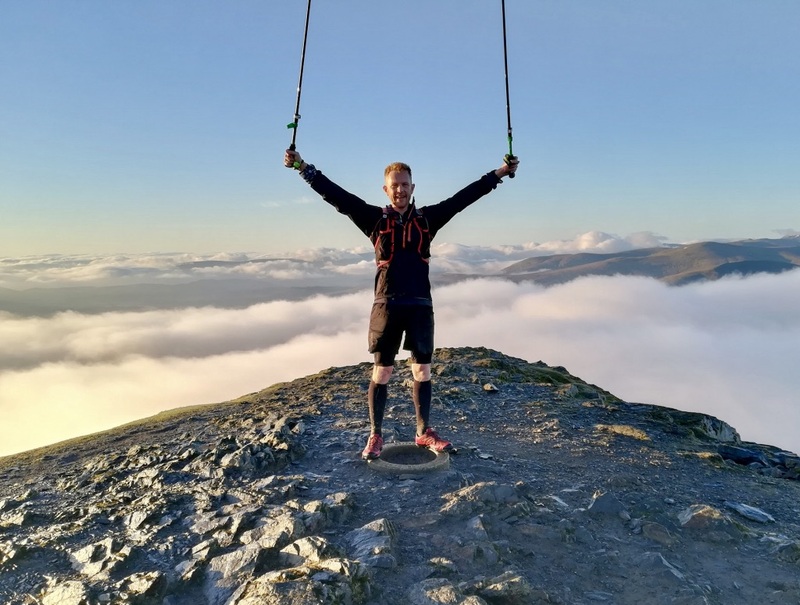 I’d never met Scott before but we had agreed to meet up in Threlkeld Cricket Club and the plan was to run up Clough Head, along the Dodds to Helvellyn, see how we were doing, then take it from there. Scott set off quite slowly and I can remember feeling that I thought he’d be going faster than this and I felt great. Then the first climb started and it was brutal. I immediately started coming out with all sorts of excuses as to why I was finding it so hard. I was telling him about all the training I’d been doing the last few days. I think Scott’s reply was something along the lines of “Whatever run you are doing there will always be someone there who has trained harder and done more so just stop talking about it and crack on”. No truer words have ever been spoken! For the vast majority of that run-out with Scott, I was struggling. Scott was always a good bit ahead and it was really hard for me to keep him in sight. I couldn’t get my head around how fit he was and how the 20 odd miles we had done that afternoon, was one of the easier sections of the course. I wondered if I could even do it but Scott reassured me for my first 20 odd mile Lakes trip, I’d done well and he thought I did have it in me and this sounded good. As time went by I started to feel myself getting fitter and fitter. I was running lots and I’d say was now completely addicted to exercise. I craved running and found it difficult to sit still. This isn’t a good combination when you don’t have any sort of training plan. Everything was great until about 20th March 2017. I’d felt ankle pain whilst out on a 20-mile run but instead of resting up I decided to take some painkillers and run another 14 miles the following day. This resulted in me limping back to a bus stop then hopping home before having to take 3 months out from running due to a stress fracture. I was gutted, Training had to stop. We had a holiday planned in the Lakes very soon after my injury and I had to stay-in whilst my wife went on regular runs without me. 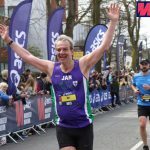 My return to running was on 10th June. My wife Susan had a place in the Durham Coastal half marathon and we decided to run it together. Maybe coming back from injury to run a half isn’t the best idea but luckily I got away with it and I was back in the game. 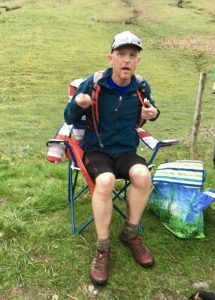 Scott Watson’s BGR was on 8th July and I really wanted to still be part of it. I was sure I’d be ok but it was decided I would meet him halfway round leg 3 and it’s a good job I did as I was knackered by the end of it. 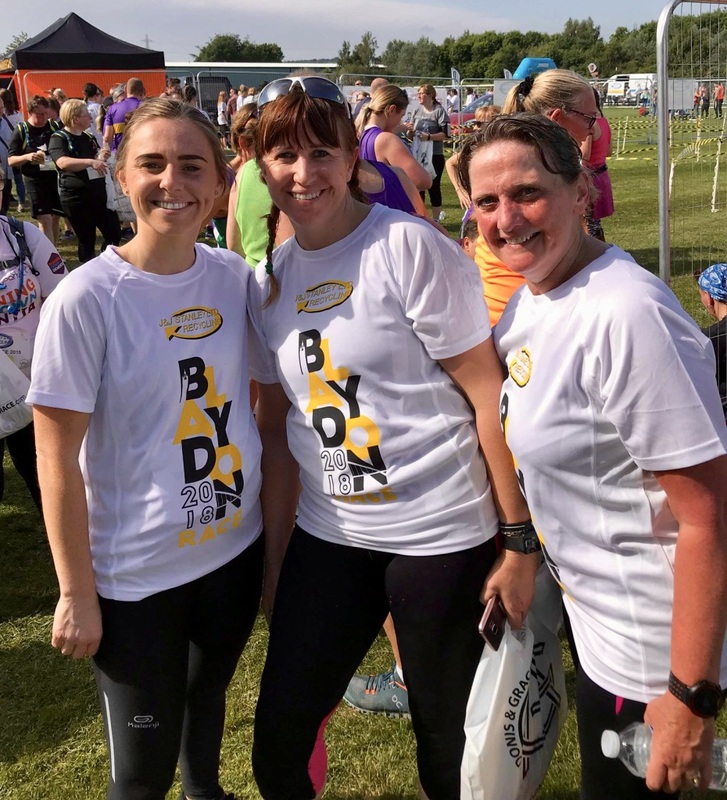 Being part of a BGR attempt really is something special and the buzz surrounding the whole day really has to be experienced to be fully appreciated. Needless to say, I drove back that day even more excited about the possibility of completing it myself. All the excitement of Scott successfully completing his round had inspired a few others to have a shot and with myself, Elaine Bisson and Dave Gibson all fancying our chances at it in 2018, dates needed to be organised. 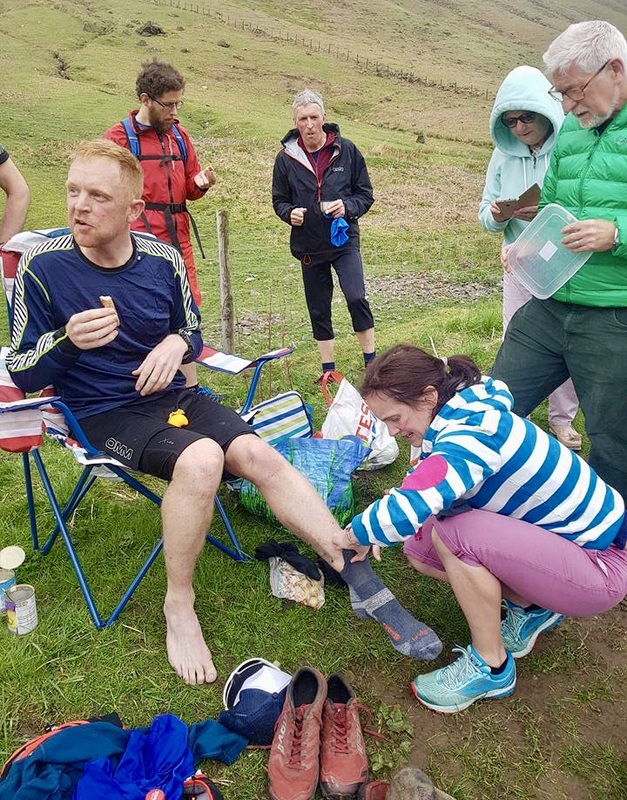 The BGR is such a massive team effort and because there are only a few Striders really into fell running I had to make sure the date I set for my round wouldn’t have any impact on the other two. Bearing this in mind I went for Saturday 5th May. It really was getting real now. 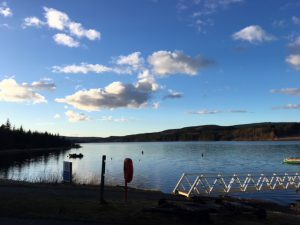 Over the course of the next few months, I made regular trips to the Lakes trying to fit them in the best I could around my work and family life. If I wasn’t self-employed and didn’t have a really supportive family and workmates, there is absolutely no way an attempt at a BGR would have been possible. All the trips over these next few months are unfortunately a bit of a blur but I did try and get down as often as I could with Scott, I can also remember sharing a couple of my earlier adventures with Geoff. Both Geoff and Scott were both absolutely fantastic in helping, supporting and encouraging me during those early days and with them both being phenomenal athletes, they really did inspire me to improve. I certainly needed to improve too as a good few of these trips with Scott resulted in me stopping several times on the way home to be sick. I used to be happy if I could make it past Rheged services without spewing! As time passed my fitness improved and I was smashing personal bests over every distance I raced. My body shape was also changing too. I’d started training for the BGR with a 36” waist wearing only large shirts and I was now wearing 33” jeans and a slim fit medium shirt. I felt great. As 2018 approached I started to get nervous as to how prepared I was. Time was moving fast and I only had 5 months left. I spoke with Geoff and he agreed to write up a full BGR training plan for me. I was very grateful. I was adamant I was going to follow this to the letter but as I’d never run to a training plan, I knew it would be hard. For the first time ever, I found myself training late at night, in the cold and dark and at times when I was really tired but it needed to be done if I wanted any chance of success. 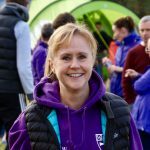 I set up a BGR Facebook group for training sessions and was constantly on the official Bob Graham 24 hour club Facebook page trying to recruit training partners and support runners. 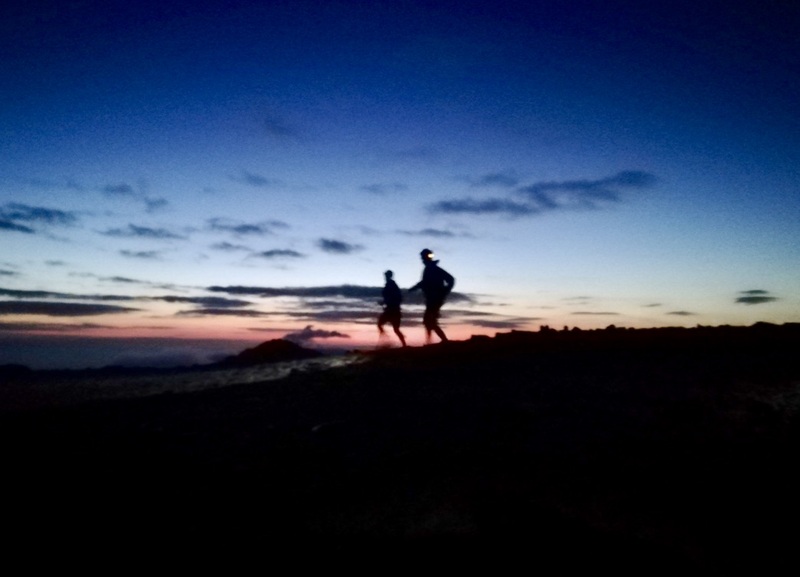 It wouldn’t be unusual for me to head down to the Lakes in the middle of the night or early hours of the morning to meet random fell runners I had only just briefly chatted with the day before. Some nights my wife would go to bed and I would pop out for a 10,15 or 20-mile run. 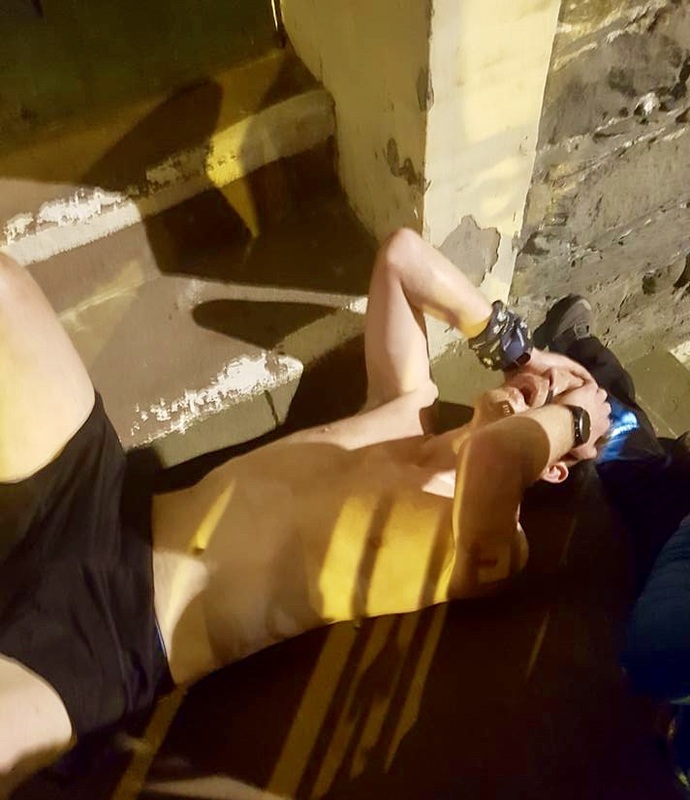 I even managed a marathon personal best one night running from Durham to Newcastle’s Quayside without having any intention to do so when I initially set off. I was completely obsessed, but this is how the BGR affects you. It got a hold of me like no other running event has even come near, this thing is in a league of its own. As Elaine Bisson’s BGR was within 3 weeks of mine our paths inevitably crossed, and I’m so pleased they did. We were both completely obsessed with the BGR in a way that is not really possible to explain or understand unless you have done it yourself. It was fantastic having someone to talk everything through with, who knew exactly what it was like. We were both thinking about the challenge every day and night. We were either training or planning to train. We were worried about weekly mileage and elevation gain, food and nutrition, kit, weather conditions, injury, support runners etc. etc. The list just went on and our poor partners could only take so much Bob Graham talk. Elaine and I ended up in a weekly elevation gain battle where we would both try and hit at least 10,000ft and I just couldn’t not do it. There was many a Sunday night when I was out doing hill repeats on Redhills Lane at 10 pm just to hit 10,000 ft. I even remember Elaine signing up to Strava as they gave slightly higher elevation gain figures than Garmin for the same run, I’m pretty sure she never managed to beat me though ha-ha! My last few Lakeland recces were with Elaine, but I’d also run with Geoff, Fiona Brannan, Penny Browell, Jack Lee, James Garland, Aaron Gourley, Mark Davinson, Andy Berry, Daryl Tacon, Des Thorp, Chris Smith, John Parkin as well as some others briefly. Jack might be able to help me with the names of the two guys who lead us off the top of Blencathra in the thick fog one cold January afternoon when we became completely disorientated. That wasn’t a good day on the hills but definitely a good learning experience. As my attempt day approached I was really starting to worry about having the right support in place. To make a successful attempt at the BGR you need to have a big team in place and this takes a lot of organisation. Once your team is sorted you then have the constant worry about someone getting injured or dropping out. After all your months of training, planning and preparation, it can soon go up in smoke if you get really bad weather on the day and you don’t have anyone to carry your equipment or with the necessary skills to lead you across the top of mountains in bad visibility. 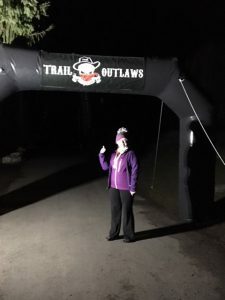 About a week before my attempt I got word one of the guys, I was hoping to navigate for me, was indeed injured and another running the same section was also worried he may have to pull out. I’ve got to say I was more than a little stressed, however, after a little shuffling about regarding who was on which section, everything was soon sorted and a full team was back in place. I’d had very little sleep on the lead up to my round as I was far too excited. I’d never before put so much into something and honestly, I think I put more into completing my BGR than I did into my degree course. I can remember saying to someone that I never remembered being as excited the night before Christmas as a small child, as I did now. The 4th of May was spent travelling down to Keswick as well as eating and drinking as much as possible. 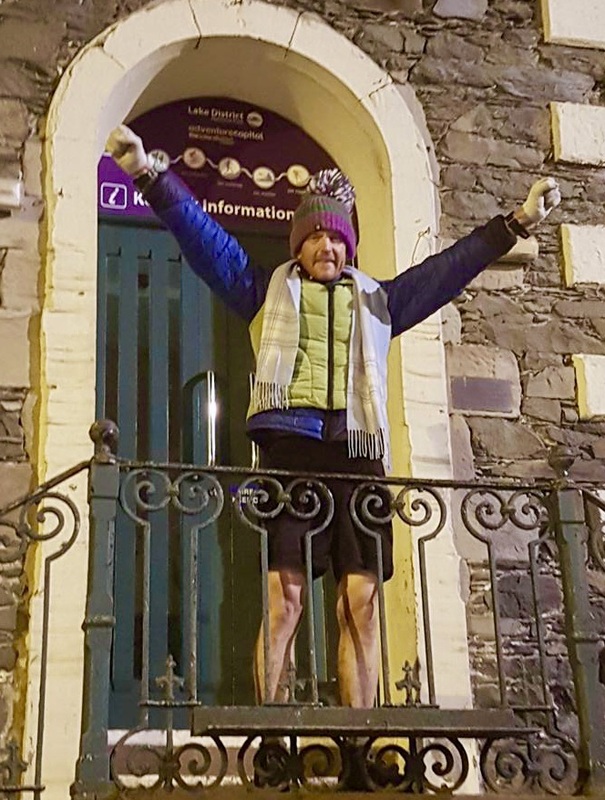 I had one last walk around Keswick with Susan then went to bed at about 8 pm; after all, I was setting off on the biggest physical and mental challenge of my life at 3 am. By 10 pm I was still wide awake and getting more and more frustrated by the second. The challenge was hard enough anyway but how on earth was I going to do it with no sleep? I woke up a little before 2 am and started eating immediately. I felt as high as a kite. I was so focused and couldn’t wait to get going. Mark Davinson and Fiona Brannan were due to meet me at the house then we were all walking down to Moot Hall to meet Paul Johnston there. As we approached the marketplace there were a few drunk people sitting about and shouting. I can remember wondering that they could go home, sleep it off, then turn out again the following night and be just as drunk again, all in the time I would be gone for one run! On the way up Skiddaw I felt fantastic, I was moving well and all was good. After 30 mins of running, Mark shouted out “What did I want to eat?”. I was still full from my massive breakfast, so took an energy gel instead. The horrible sticky thing ended up going all over the place, but at least I’d taken something. As we reached the top of Skiddaw, I had to ask how we were doing compared to my schedule. I’d actually forgotten to bring a copy myself and had no idea of any of my timings apart from that I should be in Threlkeld one leg down at 6.30am. We dropped off Skiddaw and headed across the boggy Hare Cragg. My feet were soaked but that’s no issue when you know you have to cross a river a couple of miles down the line. I had a few little bits to eat as Mark shouted reminders, then was soon at the top of Great Calva. Two peaks down and only 40 to go. The descent down to the River Calva is steep but great fun. We crossed the river and the sun was just starting to rise as we made our way to the summit of Blencathra. The head-torches came off and I was really feeling alive, clear skies, no wind, beautiful sunrise surrounded by mountains and my 3 running companions. The only people within miles, what a perfect start to the day. Paul retrieved his phone from his bag and made a short video of my ranting about how wonderful running in the Lakes was, why anyone would ever want to run on a track, and everybody should run the hills. 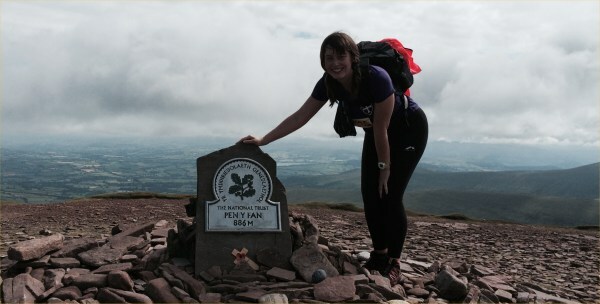 The photo at the start was taken shortly after this moment on the summit of Blencathra. From the summit of Blencathra, we set off down the steep rocky scramble via Halls Fell. The rock was a little wet and slippery in places. As Paul had done it many times before he set off at a good pace with me in close pursuit. Mark and Fiona, not being as pushed for time as me, took a safer more steady approach. 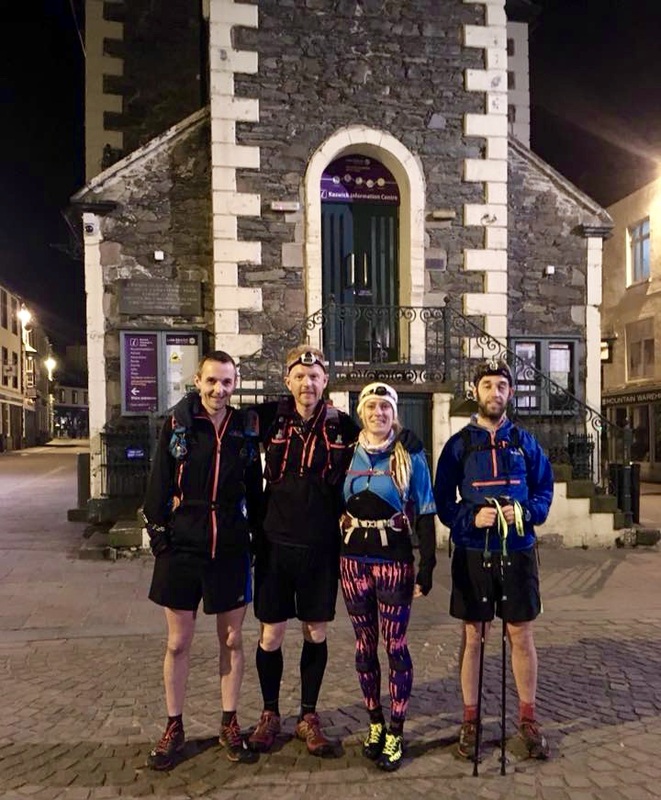 Paul and I arrived at Threlkeld at 6.37am and were first met by Geoff who directed me to my seat by the support vehicle and the others eagerly awaiting leg 2: runners Penny Browell, Aaron Gourley and Mike Hughes. I felt great, I was 7 minutes behind schedule but that was nothing. I was gutted, I’d been really fancying a few cold sausages and a hand full of mini pork pies and they weren’t there, but not to worry, I did have rice pudding and a couple of other things I can’t quite remember. I changed my wet socks and shoes then we set off on leg two. The weather was perfect and it was great to be surrounded by another group of people who had made such an effort to come and help me on my big day. It really is a humbling experience to have so many people give up their day and drive such a long way simply to assist you in achieving a goal you’ve been working towards for a long time. The climb from Threlkeld up to Clough Head is hard work and although we’d spread out a little by the top of the climb, it was no time before we were all running together again as a group of 5. Geoff was out front in charge of navigation, whilst Mike, Aaron and Penny, carried my supplies. Penny also did a fantastic job of snapping away and got a load of great photos. We were ticking off the peaks nicely along the Helvellyn range and it was fantastic having someone with Geoff’s experience leading the way. 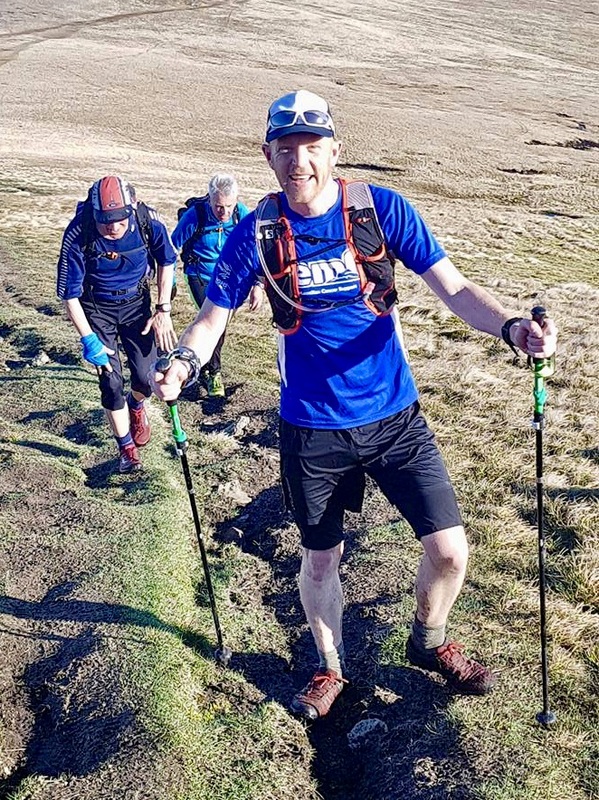 We slightly overshot the summit of Dollywagon Pike, however, this was no problem as Geoff’s knowledge of the hills is so good he quickly realised what had happened and rerouted in no time. All was still going well half way round leg 2 and I felt great, although I was aware I wasn’t really eating as much as I should be. 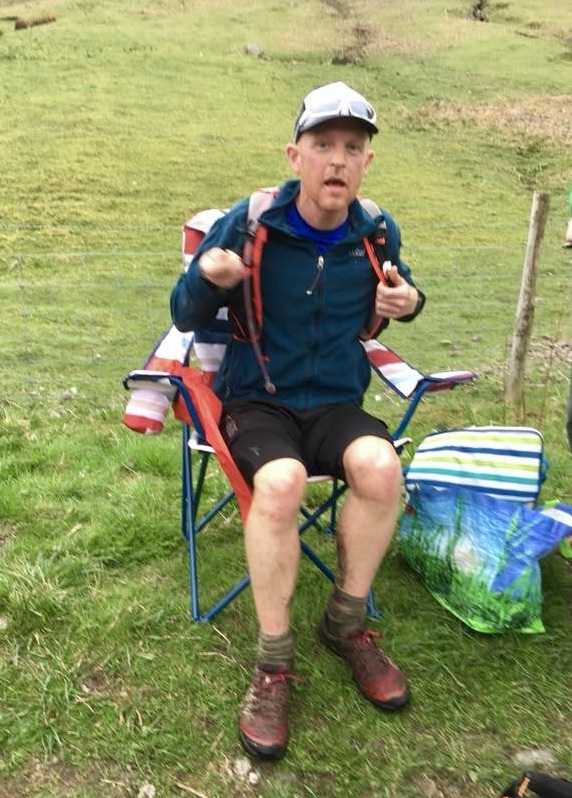 As we passed Sticks Pass, Aaron took the order for the food I would like at Dunmail and he set off down to the next checkpoint to make sure everything was waiting on my arrival. The summit of Fairfield is an out and back up the same track, so for this section, Geoff took a small break and I headed up with Mike and Penny. The fog, or in fell running terms, ‘the clag’, really started to come in on the way up to Fairfield. The temperature fell with visibility decreasing at the same time. At this point, I realised I had forgotten to pack my jacket, hat and gloves, after taking them all off at the end of leg one, but luckily for me, Mike had a spare fleece and pair of gloves I was able to borrow, to stay warm. Penny and I reached the summit of Fairfield slightly ahead of Mike but after tagging, we turned and were immediately disorientated as to the direction we had come in, due to ‘the clag’. We were just reaching for a compass when we heard Mike shouting and this got us back on track to head back down again and meet back up with Geoff. As we met up with Geoff, Mike then peeled off and made his way directly down to Dunmail as myself, Geoff and Penny headed up Seat Sandel, via a route I’d not used before. After the summit had been tagged, I really enjoyed the downhill run into Dunmail. I could see a load of vehicles waiting and knew my wife, my parents, kids, parents in law and leg 3-support team were all there waiting for me. It was the most amazing feeling ever, being greeted in by such a big group of friends and family exactly on schedule, two sections down of the biggest challenge of my life. I took my position on a chair as twenty odd people all looked over, all wanting to help and do something for me. Susan set about changing my socks and shoes as my parents tried to find all the food I was requesting. I think the first thing I asked for was a crème caramel, however, like the cool bag at leg one, unfortunately, these had been forgotten. I had an absolute ton of food in the car, just about every food I’d ever craved on a run was there but to be honest I think the choice was too big and I just kept going from one thing to the other. By the end, I’m sure I ate sausages, rice pudding, tinned fruit and mini pork pies. It was all very hectic at Dunmail and I remember Andy Berry, my leg 3-navigation man, saying I was starting to faff. Someone sprayed sun cream on me and we were off again. Leg 3 here we come. I can remember thinking at this point, surely completing the round from here couldn’t be that hard. I was right on schedule, nearly 8 hours in and two legs down and I had a full 16 hours left, how wrong could I be? Leg 3 started well with my team of Andy Berry, Elaine Bisson, Jack Lee and Daryl Tacon. We seemed to be moving really well, we were having a laugh and I felt fantastic. Unfortunately, things were about to take a turn for the worst! I hadn’t eaten for a while. I knew I had to eat, but I just couldn’t face anything we had. I was really annoyed with myself. I had every food you could imagine in the support vehicle. The one thing I can always eat is rice pudding but unfortunately, I hadn’t given any rice pudding to any of my support runners. As luck would have it Daryl happened to have one small pot in his bag. I guzzled this down and instantly felt better, however, the effects of this didn’t last too long. From this point on I rapidly started to decline and could feel myself getting slower and slower, I knew my schedule was out the window but there was nothing I could do, I knew I had to eat but I just couldn’t. My support team was absolutely fantastic and were constantly trying to get me to eat and offering me all of their own food supplies. Andy pulled out 3 fun-size soft drinks cans over the space of a couple of hours and each one felt like the best thing ever, but the effects were only short lived. Elaine seemed to have an endless supply of food and she was relentless in trying to get me to eat but I was really struggling. I started lying about eating, just to get her off my back. I was spitting stuff out when she wasn’t watching or storing it in my checks hamster style. Daryl presented me with pepperoni. I knew it would do me the world of good but just sucking the juice out of it was the best I could manage. Disgusting, I know, but tasted so good at the time. I started ranting about rice pudding and why hadn’t I brought any? I talked about the price of it, the different brands, the fact there should be a drinkable version, we should start making a drinkable version just to sell to endurance runners, surely we’d make a fortune, it could be called Rise pudding because of the energy it provided. I was obsessed and was even asking random walkers on their way up if they had any on them. Unsurprisingly nobody did. Everyone was laughing away whilst Andy managed to video me proclaiming Rice pudding was the best invention ever. Andy ended up taking my bag meaning I had to hound Jack every-time I wanted a drink but he was fantastic and nothing was a bother. At least I was still drinking. The last funny moment I remember was trying to take my compression shorts off and getting them stuck around my ankles I was really struggling to get them off and keep my balance whilst Andy recorded me with everyone else laughing away. From this point on the rest of leg 3 was a blur. 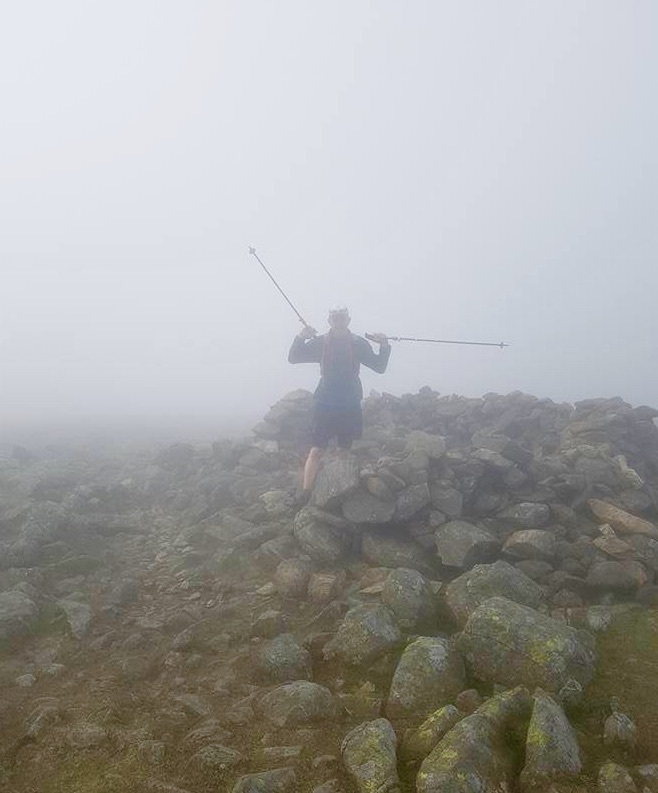 One of my walking poles snapped whilst ascending Scafell. I can remember asking why my fingers were starting to feel all tingly. I was aware some of the others were starting to get concerned about me but I was convinced if I could just make it to Wasdale and get some rice pudding all would be good. I was so relieved to get to Wasdale and can now completely understand why so many rounds come to an end here. 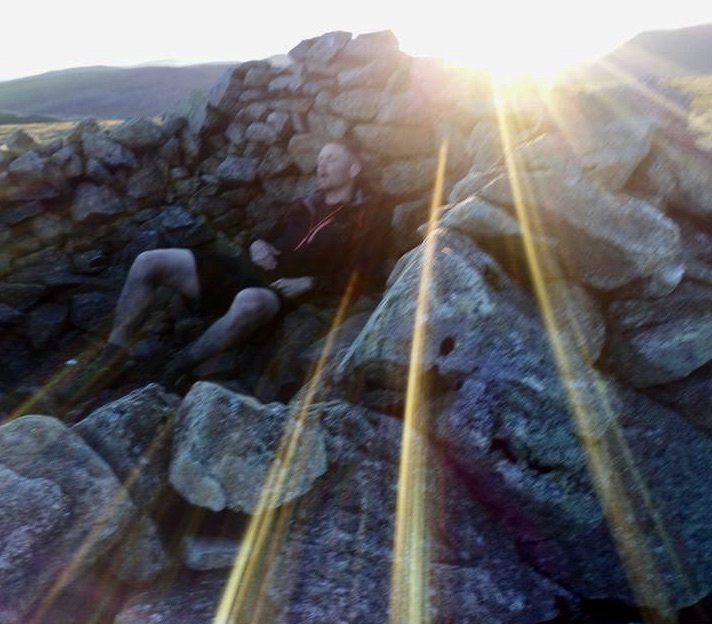 I was knackered and any fell runner will tell you there is no easy way out of Wasdale! I was determined I was not going to make any more mistakes regarding food and drink, so I selected everything I was craving from the huge supply in the support vehicle and everyone’s bags was filled, including my own. We were just about to set off when it was decided it would be crazy for me to attempt to carry my own bag. I agreed and dumped the bag. The only problem was we forgot to take anything back out of it! The climb out of Wasdale is long, steep and hard, I was in trouble and everyone knew it. Elaine would later refer to this climb as the death march and I would have to agree, I’d been convinced as soon as I’d eaten I would feel better but unfortunately, this just wasn’t the case. We all slowly plodded on making our way out of the valley at a very slow pace in deadly silence and it was such a relief to make it to the summit. On arrival I requested my can of shandy, however, unfortunately, it was not there. No problem I’ll have the protein shake instead, however, nobody had it. When I asked for the apple and nobody had that either, it immediately dawned on me that we hadn’t emptied my abandoned bag, which also meant I didn’t have a head-torch! Trying not to be too disheartened, I had a few spoonfuls of rice pudding and downed some coke. It felt great at the time, however, two minutes later I was sick and Yewbarrow was promptly renamed Spewbarrow. I could not miss the deep look of concern on everyone’s faces but James, Phil, Dave and Elaine were absolutely fantastic and just brushed it aside as they convinced me everything was still fine when I knew deep down not one of them must have really been thinking that. We continued to plod on. I was now going very slowly. I was trying to sit down at every possible opportunity. Just a couple of minutes here and there felt like the best thing ever. I honestly think if I hadn’t been on my actual attempt and wasn’t being constantly supported and encouraged by the most fantastic support crew I could have wished for, I would have just curled up into a ball and gone to sleep. As we approached Red Pike my one remaining walking pole snapped, the light was beginning to fade and everyone was constantly trying to get me to eat and drink. Luckily as we still had rice pudding this was possible. A Soreen loaf was broken down into the smallest possible pieces and mixed with the rice pudding. Every time we stopped, I would try and drink a little more. By now I was fully aware that if I didn’t get more food inside me it was game over. I was starting to panic. Darkness came and luckily for me James offered me his head-torch. We formed a line and tried our best to stay really close together as four head-torches to guide 5 people over one of the hardest sections of the BGR in the pitch dark is definitely not advisable. I remember very little of the journey between Pillar and Honister pass apart from it was bloody hard. We could hardly see. There was lots of stumbling and tripping going on and I had just about given up all hope of actually completing my round. It was a devastating feeling. Months of training, planning and preparation was on the line. Nearly 30 people had given up their day to come and help me achieve my goal and I was going to have completely wasted everyone’s time if I didn’t complete. 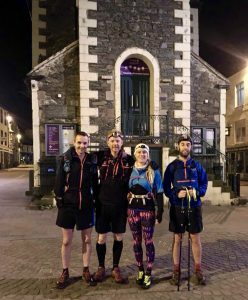 You only have 24 hours to complete the Bob Graham Round. Even if I did make it, if I was one minute late, everything I had been through would have been for nothing. My descent into Honister was very emotional, I kept saying I no longer thought it was possible, I think at the time I just wanted one person to agree with me so I could just call it a day and go to sleep, however, nobody did. The support and encouragement I constantly received from Elaine, James, Dave and Phil was second to none. There is no way I could have completed leg 4 without them and for that, I will always be grateful. As we neared the checkpoint Elaine ran ahead to ensure all the food and drink was ready for my arrival. If this thing was still at all possible, I needed to be in and out of that checkpoint as quickly as I could. I flopped into an awaiting deckchair at Honister and the look on everyone’s faces told a thousand words. I knew I was in a bad way. Everyone was being really supportive and convincing me I could still do it, however, the look on just about everyone’s faces didn’t match what they were saying. If Mr William Hill had been in Honister that night, he would have probably been offering 100/1 on me finishing. 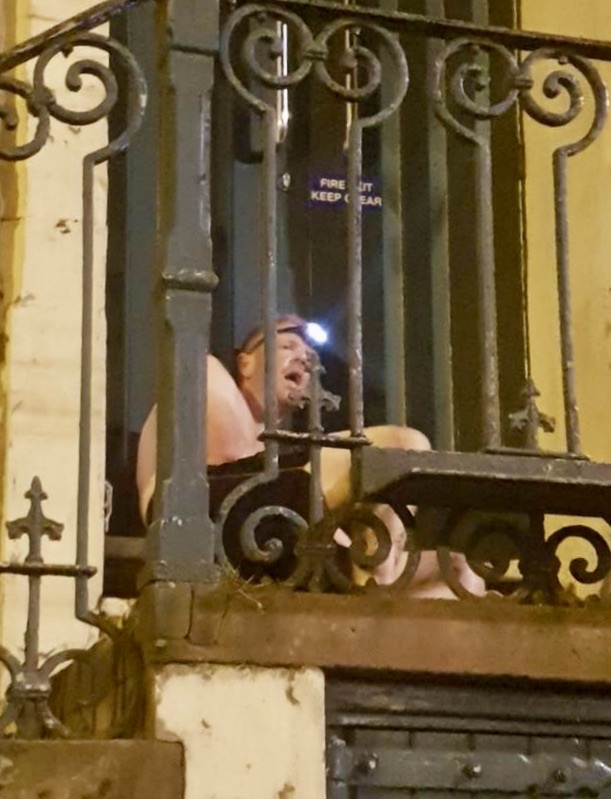 I could hardly lift my head up or keep my eyes open, there was so much hustle, bustle and words of encouragement coming at me from all angles but all I could manage was to open my mouth as my fantastic wife Susan spoon fed me rice pudding, fruit cocktail and yoghurt. I downed a bottle of protein shake and tried to focus on Geoff. I have so much respect for Geoff and everything he has seen and achieved on the fells, that I needed his opinion; I asked him what he thought I should do? After a long pause, he said to head for Dalehead and see how I got on. I was very aware of how hesitant he had been with his response but he hadn’t said to call it off, so it was still game on. It was now about midnight and I had 3 hours to get back to Moot Hall. The pressure was really on. My good wife Susan and her friend Tricia would be joining me for the final push as well as Elaine, Dave and James all of whom wanted to stay on and see me finish. I raised a few smiles whilst insisting James needed to bring half a can of fruit cocktail with him but he didn’t really complain and we all set off. I was running with Susan and she just kept telling me how proud she was and how she knew I could do this. Susan knows how determined I am and I could see in her eyes she really meant what she was saying. This had an astounding effect on me. I started to sing at the top of my voice and was urging others to join in. I think most people thought I’d lost it, but Susan joined in with me and I started feeling stronger with every step I took. The climb up Dalehead is the last major climb and I knew if I could make it up there I should be ok. I made it up in what seemed like no time and felt fantastic; I could not have been further away from the person that had arrived in Honister an hour earlier. I started chatting away with everyone and my confidence was growing with every step as we made our way across to Robinson, the final peak of the round. We went slightly off track on our way off Robinson and I think I whacked Elaine over the head about 3 times with her own walking poles, as we scrambled down a rocky section on our way to the road and the home straight. From the start of the road section, it’s about 5 miles to Moot Hall and I had about 50 minutes to get there, it was going to be tight. I was now confident I could do it but wanted the reassurance of someone running with me. I asked around to see who was ready for a sprint finish but nobody really seemed up for it. We were all tired at this point. James asked me how fast I intended to go and when I said 7-minute miles he just looked at me and said seriously “how fast?” I repeated myself “7 minute miles”; I don’t think I got a reply the second time. After a few more minutes it became clear Susan wouldn’t be able to keep up with me so after a short discussion I decided to leave her and go it alone. The race was on and the clock was still ticking. I had to make it. I started to stress about going the wrong way. I’d only recced the full road section once before and imagine the frustration and embarrassment of missing the 24-hour cut off because I’d got lost on a road! Over the next 10-15 minutes, I must have looked at my watch 30 times. With about 1 mile to go the sense of euphoria was really starting to build. Surely I couldn’t possibly go wrong now? I was going to make it, I was actually going to become a member of the Bob Graham Club, The high I was feeling was immense. With only a few hundred metres before I hit the streets of Keswick, I could see someone standing. It was Tricia’s husband Chris. He didn’t recognise me at first as he was looking out for a group of runners not one single, semi-naked man running as if his life depended on it. I’m sure he asked me if I’d seen Stuart I replied, “I am Stuart, I am going to make it!” Chris was so happy for me and started chasing after me. The next faces I saw were that of Penny and Jack I was so happy as they ran up to me to see me in. As soon as I saw Moot Hall I knocked it up another gear and sprinted at what seemed the fastest I’d ever run. The others struggled to keep up as I ran to the top of the hall’s steps and touched the door! After 23 hours and 47 minutes and with the best support crew I could ever have wished for I’d done it. 60 seconds later I collapsed in a heap on the floor quite possibly the happiest man alive. My parents, Geoff, Fiona, Penny, Phil, Jack and Chris all came over to congratulate me and I felt I was King of the World. Never before have I felt such a high like it. The cold soon started to kick in and no matter how many layers I put on I couldn’t get warm. My teeth were chattering like crazy and my whole body was shivering but I needed to see the rest of my team in. After what seemed like ages Susan turned up. She had done exactly what I had been fearing earlier and had got lost on the road section, taking a little detour around the bypass, but not to worry here she was now celebrating with me and trying her best to keep me warm. Tricia came in next shortly followed by Elaine, James and Dave, I was so happy to see them all in and struggled to keep myself composed as I greeted and thanked them for assisting me in obtaining my goal. I will never forget the sense of achievement I felt that night. Until the day I die I will be grateful to each and every person who played a part in me becoming a member of The Bob Graham Club. For anyone thinking of taking on this challenge be prepared for it to take over your life. After your first few recces, you will start to crave the mountains; you will fall in love with the Lake District. You will become obsessed with training plans, weekly mileage and assent figures. You will meet dozens of inspiring people, many of whom will become your friends. These people will suggest silly things like running in the mountains in the middle of the night and you’ll struggle to say no. You’ll end up training in the freezing cold, the wind, the rain, the dark and the snow but you will develop the deepest respect for Mother Nature. You will become obsessed with diet, kit, maps, GPS and weather reports. You will most likely try and convince your wife/husband/partner to move to the Lakes. You will bore them silly with your constant talk of the round. You will question your sanity and will often wonder why you are putting yourself, your family and your friends through it but The Bob Graham round will change you forever and I can’t imagine it won’t bring a smile to my face every time I think about it for the rest of my life. Thank you once again to every single person that was part of this epic journey, without you this goal would never have been achieved! The only problem I have now is planning what’s next and I can tell you now it’s not going to be anything small! Kielder Dark Skies had been on my to-do list, if I ever decided to do a marathon, the photos always looked stunning, it is such a beautiful place and to have full access to the Dark Skies was a bonus (if the weather played nice). The weeks leading up to the race I thought I may need to buy a set of waders but the weather gods looked kindly on us. I arrived full of excitement, if not the usual pre-race nerves. Got my number, a Trial Outlaw buff (I love a buff!! ), sorted my kit bag, a quick final bite to eat and went out for a wander around. Found the other Striders in time for an obligatory Striders selfie and we were off. I tried to stick to my race plan and not to get carried away with the crowd. Had a little chat with Dougie as we dodged the mud, before looping along the reservoir and heading back up and across the start line again. 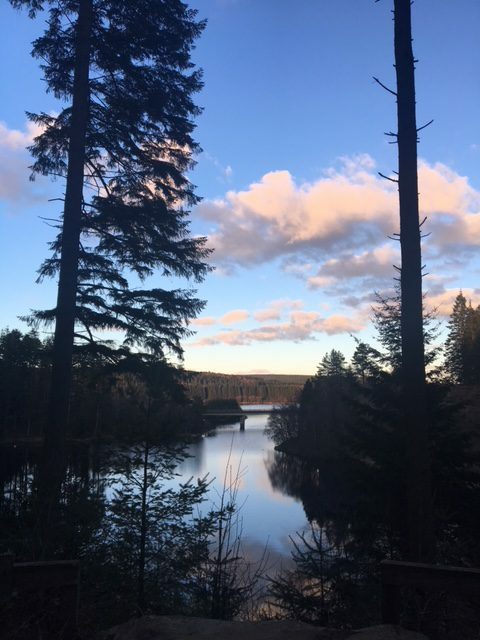 It was just beautiful, running through the forest with the regular views of the reservoir. I had had a problem with my foot 2 weeks before the race. Figuring it was tendonitis which I’d had in the past, I rested it and it seemed to be fine, well at least until mile 3!! Ouch. It started to hurt but I tested it and it was manageable so I carried on. A welcome downhill to the reservoir before having to turn back and go up the hill again!! My playlist hit the spot and along with chatting to various other runners along the way, the miles ticked by. The atmosphere was fab. 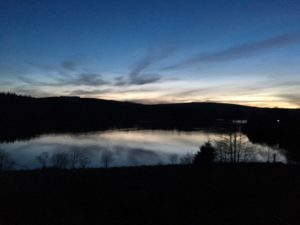 I was chatting with one guy, maybe around 7 pm and he commented on it still being light; we roughly stayed together for a while, when we realised it was starting to get dark. To see the stars appear almost one by one was magical and before long the sky was lit up with masses of stars. I was gutted that I couldn’t get a photo of it, but it will stay with me in my internal camera. It reminded me of the 6 am dive in the Maldives looking for Hammerhead Sharks. While waiting, the plankton was sparkling all around us and I thought then it looked like a clear night sky. On I went, by now head torch on and I found myself alone in the forest. 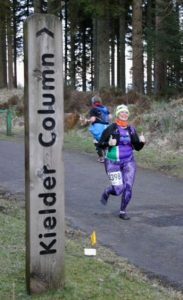 I confess prior to the run I had been a little nervous as to how I would feel in the forest, technically, on my own but I absolutely loved it. Kerry had said that when she’d done it, she sometimes switched her torch off and I even did this too, it was so tranquil. What I will say, is that while I knew it would be a tough race, I had told myself I’d done a few races with big hills Hell Runner (where we were literally clawing at the bankside to get up), Hawkshead took in the Coffin Trail, Paras 10 with ridiculous hills covered in rubble and Bacchus Marathon had 2 fairly steep & long hills which we had to do twice, so the hills didn’t worry me too much. However, I was not prepared for how relentless the ups were and that they seemed to far outweigh the downs (which when they came were often steep) and I didn’t appreciate how little ‘flat’ sections there were. Boy, it was hard going! Around mile 14 I confess I was in tears, the pain in my foot had got bad, possibly with not getting any rest from going up or down, and I did think I may have to quit at the next CP, but I was still enjoying the run and I really didn’t want to give up (helped somewhat by the paracetamol which had kicked in by the time I reached the Dam). Taking the great advice from Kerry during our Sunday runs I went with my bronze medal plan – to cross the finish line. 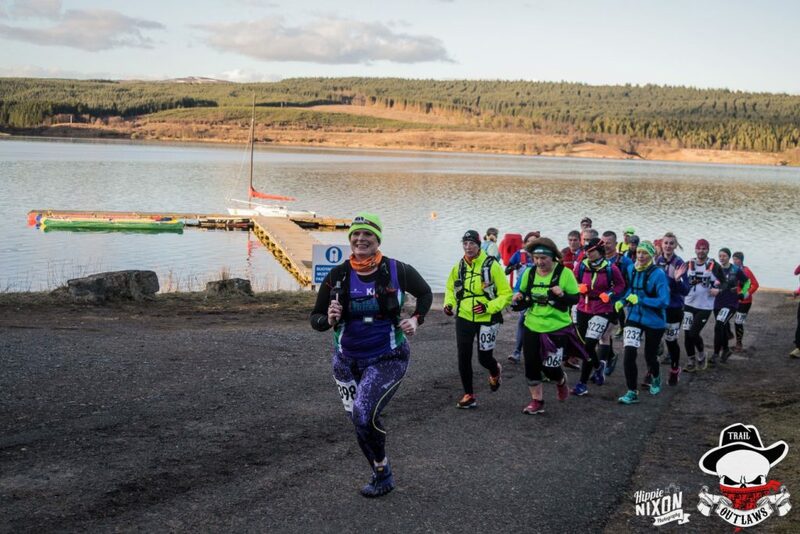 At the Dam I met up with a girl I’d ran with earlier in the race and after a brief loo stop and putting on my jacket as it suddenly felt cold, we headed across the dam. I walked this bit with her and once across I ‘trotted off’. She was still walking but with my run/limp speed and her brisk walking we matched each other fairly well and we opted to stay together. At mile 19 we were still on target for a 6hr/6.15 finish and this spurred us on but after that, I don’t know what happened. Before we knew it a few people caught us and got passed us, the hills through the wood were steep and my Garmin had died so I had no idea how far we were from the next CP. I was feeling very cold and somehow I forgot to keep fuelling. 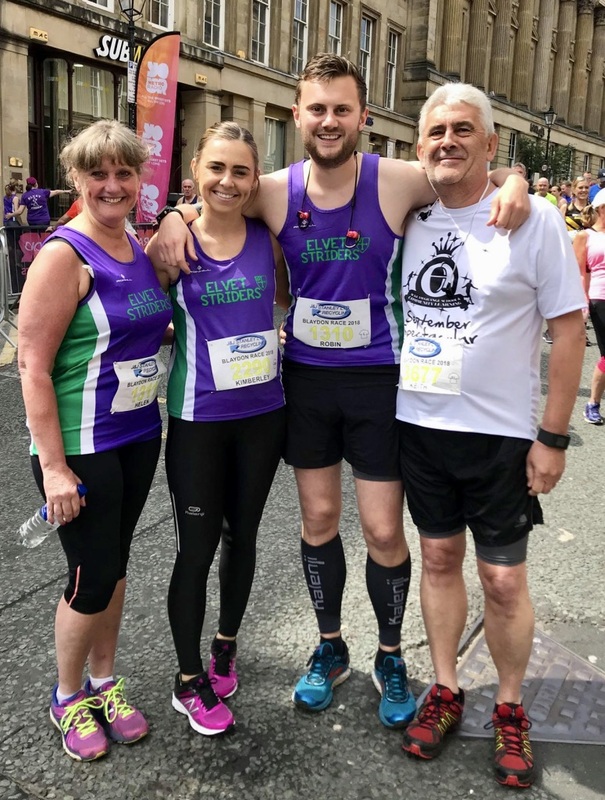 We kept pushing forward and occasionally chatting about all kinds of rubbish but it kept us going, then the thing I dreaded happened…. the tail runners caught us. We had to get to the last CP by the cut off time and their calculation was we might not make it…. I just felt sick and I know she did too, especially as she was in for the double. We pushed on and on and the lights of Leaplish were in the distance. It felt like it had been a LONG way from the Garmin dying at 22miles. We got to the CP to the marshal saying sorry ladies you’re out of time… Well I swear he must have seen our faces and quickly followed with ‘see those lights? They are the van coming down for us…. if you’re gone, you can’t be picked up’ we were like Mo & Usain as we made our way through Leaplish and I vaguely heard him say only 1.6 to go… after what we’d done that would be nothing!! We kept going one step at a time and I have to say I was in my own little world and we were through gate after gate and then the TR said just around this corner. Pain forgotten, we pushed on and even the incline to the finish couldn’t dampen my spirits. I’m sure I grabbed her arm and dragged her with me, although I almost forgot the finish was inside the clubhouse! I have never ever been so happy to see a finish line!! I think I my eyes may have leaked!! Before long my husband, Mum and Jonathan turned up inside. I never saw anyone waiting outside but it was a bit of whirl. We went over the road for our post-run hot meal. My running buddy was sat at a table, I stayed standing up (not convinced I’d get up if I sat down). We had a little hug before I left and she thanked me for staying with her, but it was a joint effort. She was staying over as she was doing the double. Given the time, due to being so long finishing & that the clocks were going forward, I opted to just head back. 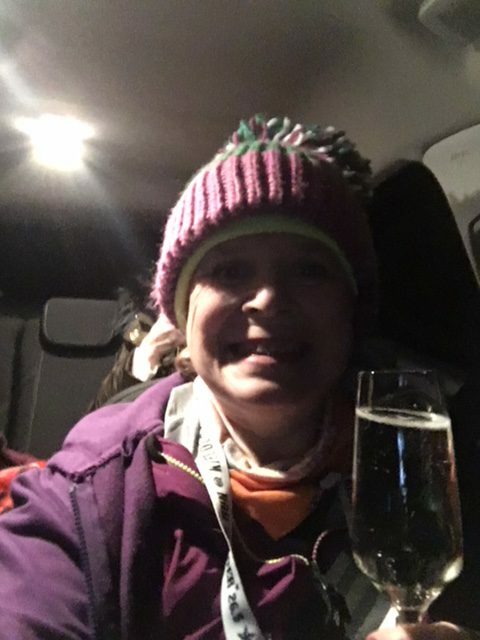 Hubby brought me a mini bottle of prosecco to celebrate my finish, which I had in the car on the way back. 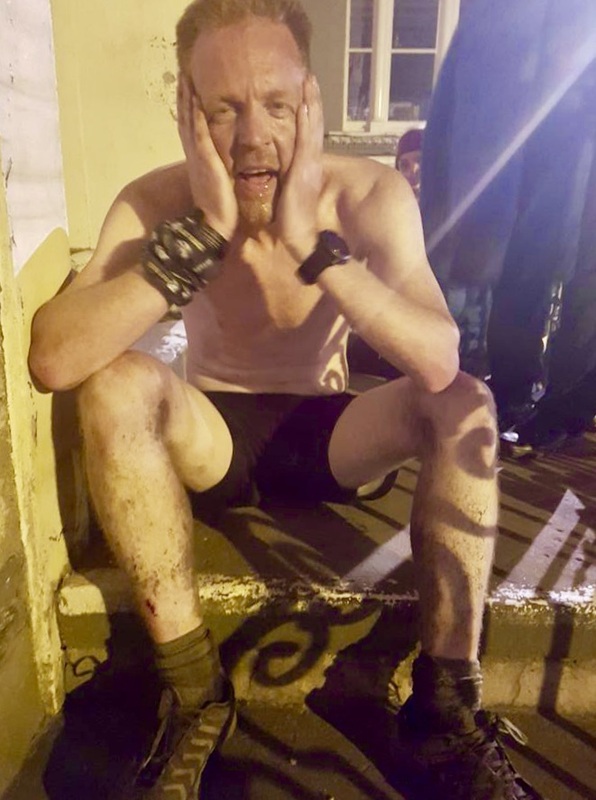 I won’t lie I was devastated to be in the last 2 finishers again, but with a fully functioning foot I am sure I would have at least managed my silver plan, however, I am grateful to the TR’s and the guys at the checkpoint for letting us through. Overall, a fabulous race and I would say to anyone who fancies it do it. It is not every day you’d get to do something like this. 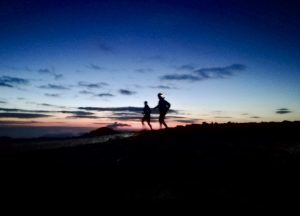 I have discovered a love of running at night and quite like running at night on my own – who knew! I took my trainers off in the car and my foot looked a little bruised. Still thinking it was tendonitis I wasn’t overly concerned. Got home, showered and put some ice on it and it was clearly swollen. 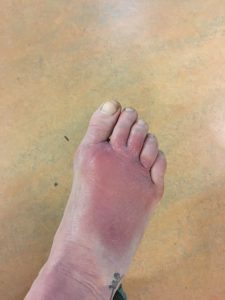 A trip to A&E on the Sunday confirmed I had a full fracture of the 2nd metatarsal (to add insult to injury they were out of purple casts!). 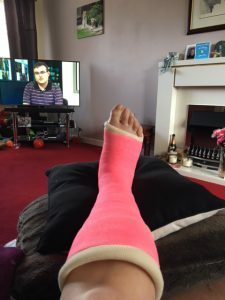 So I’m hoping this is off soon, so I can get back to Club and, fingers crossed, I am fit enough to do Loch Ness in September. It has certainly scuppered my plans for the year! What else after a rather pleasing outcome at the Georgengarten parkrun? 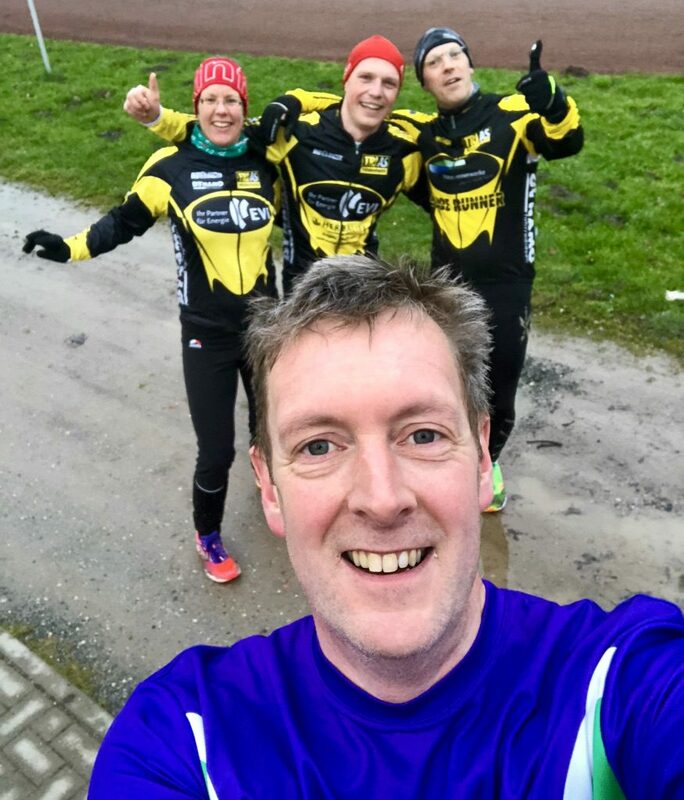 Suitably re-fueled by coffee and cake, I was looking forward to running with the TriAs triathlon club (http://www.trias-hildesheim.de/index.php) in Hildesheim, courtesy of a kind invitation from work colleague, Nils. “Come along, it will be fun, 12km or so at a steady pace”, was what I heard. The first bit was certainly true! We met at the DJK Sportplatz at Hildesheim, where the club also has use of a track – more on that to follow. With introductions made, we ran over a couple of bridges and followed a riverside path in a loop – a shade over 8mm pace. That seemed to be the warm-up, and we then headed for the hills, literally! We climbed up a gravel path through the Steinberg woods, past a zoo and taking in a great view of the surrounding area. At this point, I lamented my decision to opt for road shoes – my new Saucony Koa STs which I’d left in the car would have provided a bit more traction on the muddier bits. We dropped down back to the DJK Sportplatz hitting 13km. Most people said farewell at this point but there was a (very good) plan b, partly for one of the members who was training for an Ironman event. We bolted on a 5km sight-seeing tour of the old town. Hildesheim is renowned for its historic churches, and we passed St Mary’s Cathedral, a UNESCO World Heritage Site. We also passed a whitewater canoe course which looked amazing, prior to returning to our starting point. I joined in a “warm-down” with a twist, as we headed to the track for some drills which included some sprint efforts! Just over 18km, an average pace a shade faster than 9mm, and we were done. The mixed grill and isotonic Weißbier tasted really good when I got back to the hotel! 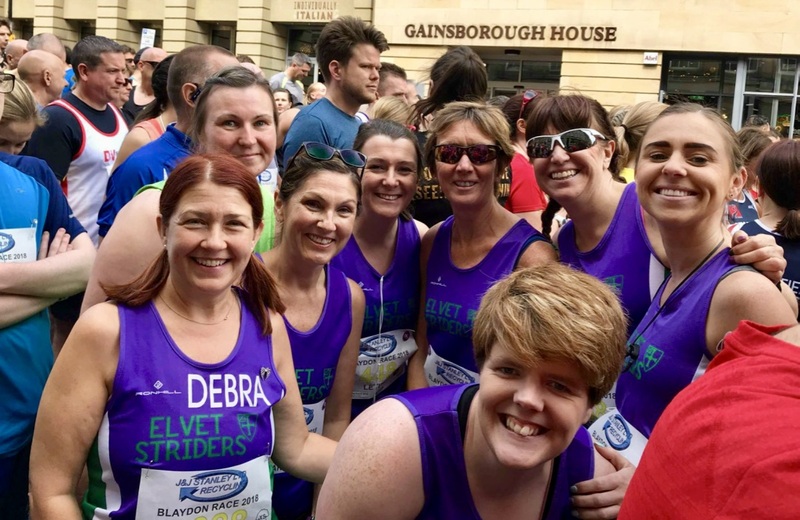 An amazing bunch of people, and a capable triathlon club who put on a fantastic running tour – thanks all, and you will be very welcome to run with us if you visit Durham. For some time, I have been interested in what some may see as a slightly unusual run; inside London Heathrow airport Terminal 5. My motivation comes from spending way too much time in airports, and Ben Edelman, an associate professor at the Harvard Business School, and author of guidance for running in and around airports. On the morning of 14th March, I had my chance. I arrived in Heathrow’s Terminal 5A, from Newcastle. My next flight (to Madrid) was also due to leave from Terminal 5, so having already cleared security at Newcastle, I headed to BA’s North Galleries lounge. 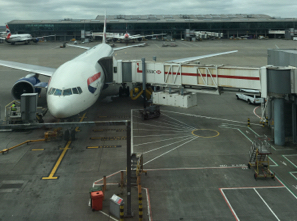 Perhaps fortunately for this adventure, I still have lounge access – there are changing facilities, you can leave your bag and, instead of a pre-flight G&T.…go for a run! I struggled to get a GPS signal initially but the Strava app on my iPhone seemed to cope with a combination of GPS, cellular, and Wifi positioning. I headed down the escalator to follow the signs for the transit to the B and C gates. There I took the lift down to level -4, leaving most passengers to alight at -2 which is the train platform. 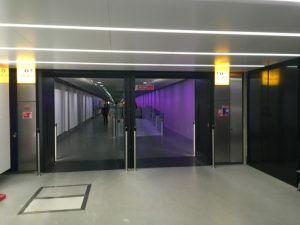 The main feature of this run is an underground pedestrian tunnel linking Heathrow’s Terminal 5A to the satellite buildings which house the B and C gates. The tunnel is some 670m in length between T5A and T5C, according to Bombardier who supplied the automated people mover system (trains which run above the pedestrian tunnel). 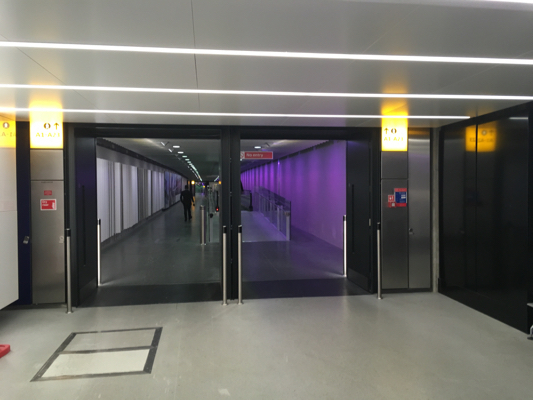 The tunnel has apparently been recently renovated to add a softer floor, and purple lighting – welcoming to a travelling Strider! There are various moving walkways along the way, but also space aplenty to run. There are a couple of narrower sections, which makes life slightly interesting to share the tunnel with a passing passenger cart, and there is a slight incline between the B and C gate section. There aren’t many users of the tunnel – mainly air crew, the odd passenger, and it is fairly cool. At the final approach to the C gates, a traffic light controlled door allows safe passage of pedestrians and carts. 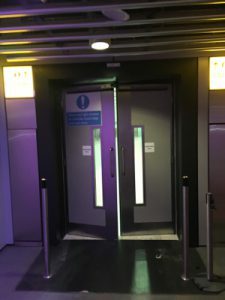 I headed along the tunnel, to pass the B gates, then on to the C gates, where I got in the lift and up to the satellite building. I ran around the satellite building, which was nearly empty. A member of BA gate staff stopped me to ask what flight I was on, and she was tickled when I explained, “Madrid, but I’m just out for a run first”! 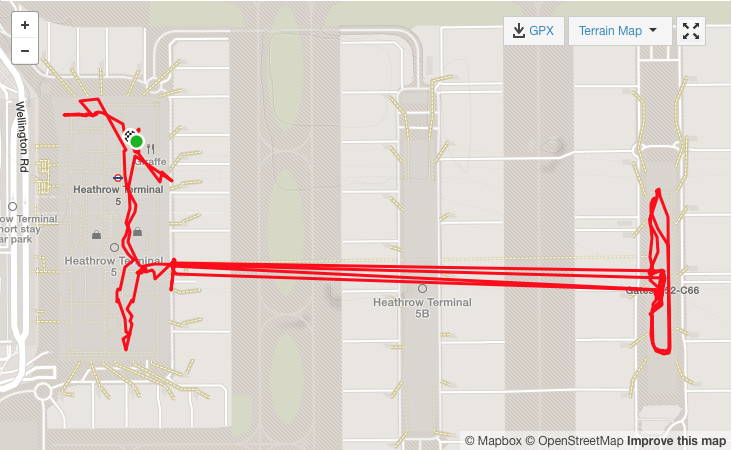 I ran the loop from T5A to T5C, including the loop of T5C satellite building twice, before doing a 1km loop of T5A, returning to the North lounge to shower and collect my things. 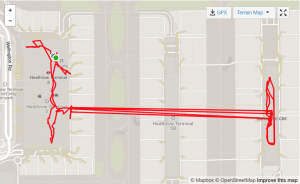 An interesting experience of some 5.7km which left me refreshed for my onward flight! If you have time in Heathrow, try it! Having mainly stuck to park runs and a few 10K races, I thought it time to push the boat out and try something a little longer. Not quite ready for 10 miles yet so when I saw the Kilburn race, I thought why not. 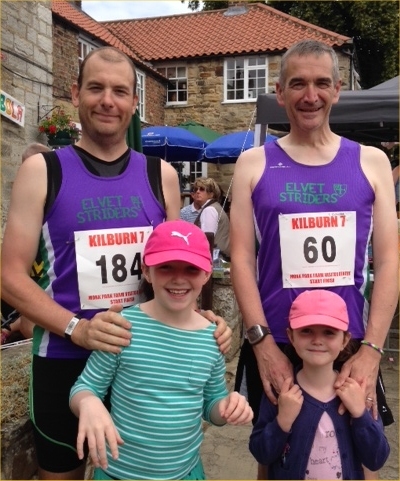 It was in the afternoon so no early start; it is called undulating so no serious hills (supposedly); it was in North Yorkshire (almost as nice as County Durham); it was a village fete so the family could come along and best of all there was a public house at the finish line! So all the Rodgers family headed off with the constant call from the back of the car, are we there yet and will there be ice cream. We arrived to find plenty of parking and even toilets in the car park. We then bumped into Alister on the high street so I did what was right and let the kids pester him, while he tried to get them to become parkrun volunteers. So far so good as race time approached the kids went off and attacked the tombola and Mr Robson and I found our respective places in the pack. With the words of Alan Sehault in my mind about pacing, I set off at a steady 5.00/Km with the intention of running round in a less than an hour. First mile done and then I started to appreciate the reminder from my wife to put sun block on as it was getting very hot and very sunny. The first portion of the race is quite gentle, a small couple of hills and a nice descent, then you realise that ‘undulating’ has a different meaning in Yorkshire, I would read it now as very hilly! Thank goodness for the helpers at the 3 water stations and 2 sponge points, they even had a car driving round offering water to those of us at the back. So back to the run, I will admit to drifting to a powerwalk on one of the big hills and the constant changing of the running line to find shade. There was a chap of senior age running with me, never found out his name, but thanks to him for dragging me round the undulating bits. At mile 6 I thought one more to go and managed to pick the pace up again especially when I found out that the last portion was downhill. Then a shock as I passed the 7 mile marker with no sight of the finish line, it seems that in Yorkshire racing they are generous with the distance and so I ‘sprinted’ the last 700 odd yards to be cheered in by Alister and my family with the best thing of all, a photo by Helen of me with both feet off the ground. Now to the key point, the pub at the finish line allowed for 3 pints of carbo loading and an understanding wife to drive me home! Time just a tad over 1.03 so very happy given the hills and the conditions. 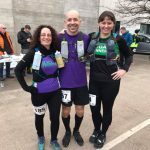 This is a great race and is worth a larger strider turnout, wonderful route, brilliant organisation and plenty for the family to do while they wait, although I am not sure what Alister will do with the coconut the girls gave him. Oh and there is a pub at the finish line. So, after cheering my hubby on in January at the Avalance Endurance Events Winter Fan Dance, he and his friend booked for the summer one. 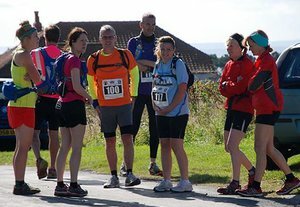 Unfortunately The friend got a bad back following the Durham Coast Half Marathon a few weeks back, and as it was so near the event, no money back or deferral til next time, there was, however, an opportunity to transfer the place for the sum of £10. 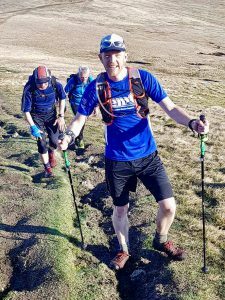 Weellllll, I had done Swaledale, Penshaw, Roseberry Topping, Round Sheffield and a couple of other half marathons so surely I’d be ok for ‘a gruelling 24km non-navigational race over two sides of Pen Y Fan, the highest mountain in the Brecon Beacons. 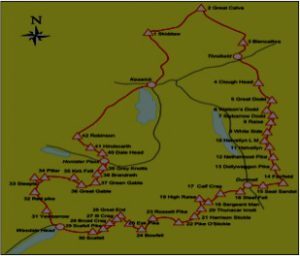 This infamous route has long been a part of SAS (Special Air Service) and SBS (Special Boat Service) Selection and is considered the yardstick of a candidate’s potential to perform well on Test Week and ultimately pass the Special Forces Selection programme.’ taken from the website. Took the option to go ‘clean fatigue’ or non load carrying to the uninitiated. Rob went for the load bearing option (as expected). Borrowing Denise’s fell shoes and waterproof jacket, off we went on the 6 hour drive to Brecon. As we approached Rob kept pointing out very high points on the landscape. Not sure if he was trying to scare me or prepare me. anyhow we arrived safe and sound, settled into our hotel and set the alarm for 615am. The morning came around and in silence we prepared separately for our upcoming challenges. The weather looked okay, the tops were shrouded in mist and the weather forecasts said 20/30% chance of precipitation. Not bad odds really. At the red phone box of the Storey Arms 830am came and the rufty tufty load bearers had their briefing from former SAS fella Ken Jones and off they went . I had another hour to wait til my set off time so, as you do, started chatting to anyone around me. The folks at the Fan Dance are a good bunch of people, unpretentious, all ‘bricking it’. Finally 930am arrived, we had our briefing, well the folks at the front did, at the back ( my natural place) we couldn’t hear, however, me being me I forget instructions very quickly so probably funny miss much. Off we went, the sun started coming out, the first hill was long, the first 2 miles were all climb, too much for me to run, and in fairness I didn’t see much running at this point, I did however start overtaking people and eventually found my pace with a lovely lady called Sue (who had suffered a back problem, had surgery and found a new love of all things fitness) and her nephew Ashley ( who was training to run 6 marathons in 6 days for charity). I managed a little jog at the bottom of the summit (if that makes sense) of Pen Y Fan and left them behind for a short while, and reached the summit (886 m) in about an hour. Considering the climb I was well pleased with that, and of course had to have my photo opportunity. Off we went again, to Jacobs Ladder, well all we saw was a precipice, fortunately there was someone who knew what he was doing to show us the way, imagine Roseberry Topping on steroids on top of another mountain and that’s Pen Y Fan and Jacobs Ladder. Once down there we hit the Roman Road, the main challenge here being not breaking an ankle or face planting (again). Plenty of ‘well dones’ and ‘keep goings’, eventually passed Rob on the return journey with his bumbag full of burst gels and massive blisters on both his feet. Just after mile 7 was RV2 also known as the turnaround point, good glug of water and some flapjack for the return journey, a quick check by the DS that I was fit to continue and off the three if us went again, a bit of a jog here and there as terrain allowed then there it was. The monster that is Jacobs Ladder – part 2. Bigger and uglier than going down was going up. Load bearers were struggling to stay upright and keep moving, it was long, very long then that little steep scramble at the end to reach the Pen Y Fan summit for the second time. Now we knew from here it really was all downhill, well apart from the little up hill bit. 4 hours passed, which means we did not managed to complete the course in the time required for SAS selection, secretly we were all pleased about this as we didn’t really want to join the SAS anyway. With the thought of collecting our patch and enjoying the promised hog roast we practically skipped the last stretch, seeing the red phone box of the Storey Arms and Rob standing there we knew our journey was complete, we had done it! With Hugs and handshakes from everyone we had encouraged, passed, hi fived and raced we made our way back to the car for a well deserved bath and Fan Dance Race beer. 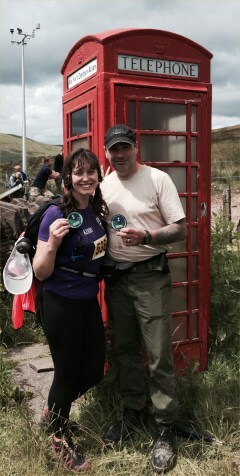 The photo with the patch and the red phone box – 2 icons of the Fan Dance Race experience, had been taken. Was it a challenge? For sure. Would I do it again? Absolutely. Will I do it with a full load next time? Probably. 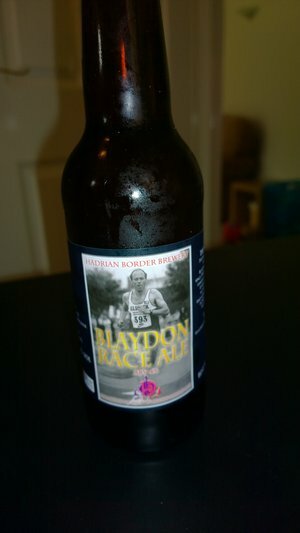 As I sit here finally drinking my Blaydon Race Beer (& checking the Striders website to make sure there aren’t already 20 race reports), I thought it was about time to write about my first experience of this famous race. 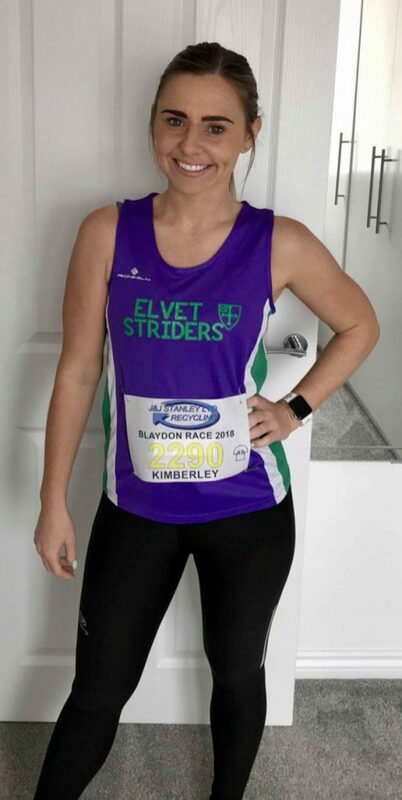 I had attempted to register for the Blaydon Race all those months ago but being a mere mortal (ie. not yet a Strider) & having to join the masses on Day 2 of registration, I was unsuccessful. To be honest, I’d assumed that was that & carried on with my life! Until, the Friday before when a colleague of my husband emailed around work offering his wife’s race number, I said “Yay” immediately, all sorted, until his wife came home & revealed she had given the number to someone else. Who’d’ve thought I’d be so gutted not be running (certainly not me a few months ago!). A long weekend at work with intermittent chances to check emails meant I was too slow to claim another couple of numbers until finally on Sunday evening, I got one!!!! So, Monday 9th June after a frantic rush around getting kids/husband sorted, I arrived by the viaduct to get the Striders bus. I could’ve done a couple of laps round the viaduct looking lost but thankfully the bus pulled up so I followed it to the stop to be greeted by a gaggle of purple. My first time on the Striders bus, very exciting & my first time reading the words to the Blaydon song (????????? I’m from the South so no idea what they’re on about!). The bus was a tad warm by the time we arrived & I have to say I was a bit concerned what the smell would be like for the return trip. We pulled up at the cathedral to be greeted by even more purple & went en masse in search of toilets, joining a queue of Blackhill Bounders into Subway. So, we joined the crowds eagerly anticipating the race, we stood for a while waving our wrists as high as we could to try & wake up the Garmins & then it just kind of started, I didn’t hear the song or the bell, we just started walking a bit, then a bit faster, then crossed something that could’ve been a starting line & started slowly running & following the masses. Then all of sudden, I looked down at my wrist to see what the beep was & I’d run a mile in 8.38, then the second in 8.50 – no wonder I was tired! The next few miles were a bit slower but I kept going. It was hot & humid but I just got carried along by the crowds & the roadside music & drums & I still kept going. Around mile 4 I started to think I might run the whole way without any walks encouraged by my running friend who’s a lot more experienced & better runner than me struggling – I was keeping her going this time! The incline up the bridge was tough as was the run along to the water station passing runners on the other side of the barrier knowing that we had to run back along there. The water station was a beautiful site – not sure how much of it ended up being drunk versus thrown over me. Then all of a sudden, I was in Blaydon with the lovely sight of more crowds to cheer us on to the finish. The mileage on my watch didn’t quite match up with the marked mile signs, coupled with not knowing the route & where the finish was meant I probably held back a bit in the last stretch – I thought it was going to end at the bus station but it kept going. I was so proud to collect my t shirt at the end – I ran the whole race in a respectable time of 53.55 & I’m still grinning now. So from me, thanks to Lesley Charman & Helen Thomas for the third-hand number– hope I did you proud, thanks to the Striders bus for the introduction to the lyrics, thanks to John Hutch for the offer of black pudding at the end (honestly, the absolute last thing I could’ve eaten but thanks anyway), thanks to the two Lauras for the chat on the walk back to the bus, thanks to Paul for the lift home & thanks to the other 64 Striders for the purple visions.